Severe storms make most of us run from the highways and put off even short distance trips to the grocery store, instead choosing to live off of ramen noodles rather than die trying to buy a microwavable burrito. 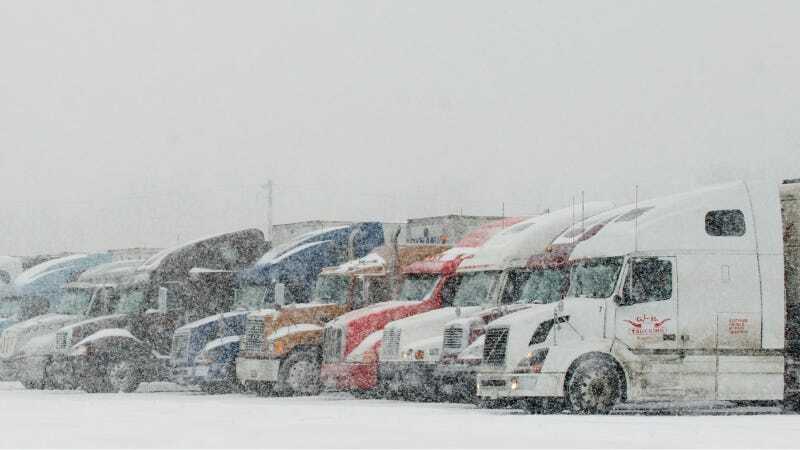 Yet, counter-intuitively, winter storms can correlate with increases in commercial trucking. Strong weather obviously makes for more dangerous driving, and truckers who spend their lives behind the wheel are familiar with the risks. But they're also generally paid by the mile or by the hour, incentivizing them to keep rolling as long as they can. In the spirt of deterring fatigued drivers from manning 33,000 vehicles in traffic, the US federal and state governments regulate the amount of hours commercial truck drivers can work. While some argue these rules are often broken, they exist and are theoretically adhered to most of the time. But when severe weather affects significant populations, states can lift working-hour limitations for truckers hauling goods deemed necessary for relief. Some such temporary amendments are in effect right now, primarily applying to hauls of heating fuel and propane. The Commercial Carrier Journal has a running list of which states are affected. In case you needed another reason to stay off the road in the next blizzard, now you know whoever's behind the wheel of every LPG tanker you pass might have been on the move for more than eleven hours.